This summer, cinema screens across the country will be showing more than the latest reboots of Transformers and Teenage Mutant Ninja Turtles, as Drum Corps International gets set to make its annual appearance on the big screen for two exciting events. DCI will once again partner with Fathom Events to bring drum corps action to movie theaters across the country, first with the season-opening "DCI Tour Premiere" in June, with a much-anticipated "Big, Loud & Live" sequel in August that will feature live performances from the DCI World Championship Prelims. The "DCI Tour Premiere" will be shown in movie theaters for one night only, Monday, June 23, marking the fourth straight year that DCI has produced this early-season showcase to kick off the start of the annual DCI Summer Tour. The cinema event will be taped at the Innovations in Brass competition in Akron, Ohio, Saturday, June 21, before it's rebroadcast in more than 400 movie theaters across the country just two days later. Spectators will get a look at a dynamic group of corps that will be vying for the 2014 DCI World Championship title, including the defending Champion Carolina Crown, along with the Bluecoats, Boston Crusaders, Madison Scouts, Phantom Regiment, Cadets and Cavaliers. Along with the performances of these groups, theatergoers will get a preview of all that's in store for the more than 100-event DCI Tour in June, July and August. "Even a decade after first being shown in movie theaters, we're continually impressed at how many people support our Drum Corps at the Cinema events, and how that support grows each season," DCI Director of Business Development John DeNovi said. "Theater attendance has been on the rise over several years as more and more marching music enthusiasts take advantage of these opportunities to gather with their friends, sport their team colors and head out to the cinema to mark the official opening of the summer drum corps season." 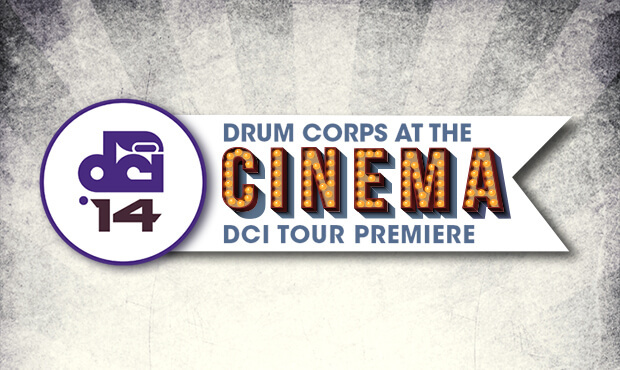 Tickets for the "DCI Tour Premiere" will go on sale through FathomEvents.com coming up on Friday, May 23. Learn more about the "DCI Tour Premiere"
Now in its 11th year, "Big, Loud & Live" will showcase spectacular performances from the DCI World Championship Prelims on Thursday, Aug. 7. The event will be broadcast live via satellite from the state-of-the-art Lucas Oil Stadium in Indianapolis. Theater attendance has steadily risen since the very first "Big, Loud & Live" program in 2004. Appearing in just 44 theaters in its first year, the event is now annually shown in more than 600 movie theaters in nearly all 50 states, boasting a combined total attendance more than a quarter-million strong. "Big, Loud & Live 11" will feature the performances of the top 15 corps at the DCI World Championship Prelims, along with highlights of groups that performed earlier in the day. Drum corps fans can get their tickets for this event beginning Monday, June 23, and they can sign up for an e-mail reminder or text DCI2014 to FATHOM (328466) to receive future event updates. Learn more about "Big, Loud & Live 11."